If you are a child of the 1980s, Alvin Schwartz’s holy trinity of scary stories for children likely gave your library card a decent amount of exercise. I recently sat down one winter’s evening to revisit the tales. These Boo Men would have given T.S. Eliot a case of the Hoo-Has! (And perhaps you’re alive/And perhaps you’re dead/Hoo ha ha – http://www.lrb.co.uk/v38/n16/mark-ford/i-gotta-use-words). I did not remember Stephen Gammell’s illustrations being so terrifying, but many of them truly are! My favorite tales from “Scary Stories to Tell in the Dark,” which is the first installment of the series, include “The Thing;” “Cold as Clay,” “The Guests,” and “Room For One More.” I loved that these all involved ghost stories or premonitions of death. Arguably, as an adult reader, the stories that foretell death are truly the most terrifying tales in the bunch. In “The Thing,” the boy touches the wraith to see if he is real, is followed home by said wraith, and is seemingly marked for death, succumbing within the year. Whether or not the laying of hands on The Thing is what caused his death, or not remains open for debate. What I mean is, if the boy did not actually touch the wraith, would the premonition not have come to pass? Could he have escaped death, or was it coming for him nonetheless, no matter what he did? For instance, the character in “Room for One More,” has a dream of a hearse pulling up in the driveway, and the driver looks at him and says: “There is room for one more.” He thinks that he is dreaming. He goes into work the next day and finishes his day. He goes to leave the office and presses the button for the elevator. Inside, stands the driver of the hearse. “There is room for one more,” he says. The man declines, and the elevator goes on to crash and everyone dies. The man somehow escaped death because he remembered his dream and did not go when summoned. But does he escape without consequence? When death comes again, will he be even more pissed? “More Scary Stories to Tell in the Dark” contains a story that is straight out of a horror movie, and if I ever write a horror script, I will make this scene my own. “One Sunday Morning” is the tale of Ida and what she sees when she is awakened in the dead of night by the church bell. Those of you who know firsthand that one of the scariest places you can ever be is inside the darkened sanctuary of a church at night will be creeped out beyond belief by this short tale. What do they get up to in there during the dead of night? You don’t want to know. And you certainly don’t want to be there for it! The Annotations about this little piece of folklore state: “this tale is rooted in the ancient belief that the night belongs to the dead and that places of worship are haunted after dark.” I have no doubt. “Scary Stories 3” contains two very chilling tales of death’s arrival: “The Appointment,” which is apparently another ancient tale (this one is based on a young man seeing death in the marketplace in Damascus), and “Like Cat’s Eyes,” which reminds me of what happens in the 1990s movie “Ghost,” when the bad men die. CREEPY AS ALL GET OUT! If you have not picked up this series since you were ten years old, I highly recommend that you treat yourself to a new look as an adult. But not if you are alone at night in your house. Don’t get crazy. 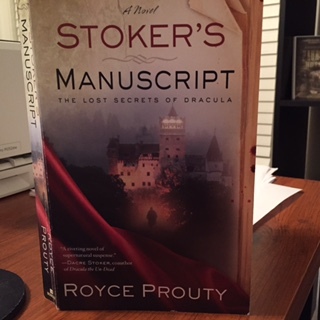 Royce Prouty penned this debut in 2013 and was a Bram Stoker Award Nominee for “first novels.” What a fun/scary ride! I love a book about a book, but throw the legendary Dracul family in the mix, and you have me up at night turning pages! The elements that really worked for me were: the idea that an informer with inside knowledge into the Dracul family/vampire culture was actually giving Bram Stoker notes when he was writing “Dracula;” the idea that there were missing pieces from Stoker’s manuscript that needed to be found; that God created the vampire first before he created man, and after seeing what he did, gave man a soul; and the personalities/dialogue scenes between Radu/Joseph and Vlad/Joseph. I’m not sure if this is what people call “fan fiction,” but if it is, I’m thinking this is the first piece of fan fiction that I enjoyed. Definitely time and money well spent! Multiply that paragraph to fill up a 290 page book, and you can see why I did not exactly fly through this book. It was work for me, not an easy pleasure read. There are plenty of terrifying scenes involving the carnival and its characters, and the book is absolutely a prime example of how “to get it right” if you are an author studying such things. I’m just saying read this when you have a caffeine buzz, and not when you are tired from having already worked all day! I did enjoy the feel-good aspect of the father (a janitor in the town’s library) getting to play the hero to his son and his son’s friend, although some might say the Aw Shucks aspect of the early 1960’s does not translate so well to today’s times (which is a shame).